It is one of Ryan’s most common inquiries. And when he asks it, it means he is bored. Typically, the question comes after we have prodded him to get ready for some activity — say one of Riley’s soccer games — that he is not thrilled about. If he finds himself with as little as five extra minutes between the time he’s ready and the time we have set to leave, he gets very agitated. The first thing we usually hear is a loud, angered grunt, followed by the declaration “I’m bored!!! !” followed by the dreaded question. He won’t go back to whatever activity he was doing before — typing hockey standings, playing with his Hockey Guys, etc. — because his play is so structured that he can’t just spend a few minutes doing something. If he doesn’t have time to start and finish, he won’t even start. His interests are so limited, and his resistance to spontaneity so strong, that it can be difficult to find anything to fill those five minutes other than arguing about what he could be doing until it is actually time to go. It’s an exercise in circular logic that doesn’t really fit in Ryan’s linear world. 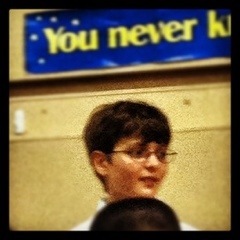 Last night was spring concert night at the kids’ elementary school. The kids had back-to-back performances, but we arranged it so Ryan wouldn’t have to arrive until the appointed time for his grade. To say we were looking forward to this evening would be a stretch. Neither child has exactly been dedicated to practicing their craft. Two concerts meant it would be a long evening in the un-air conditioned gymnasium/auditorium. Put another way: had the Devils had a home game last night, both children would have been MIA. Ryan is actually quite musical. He listens to music all the time and has a lovely singing voice which can often be heard emanating from behind the closed door in his room. He tried playing an instrument when his entire grade was required to do so last year, but showed no inclination to stick with it, so this year he is only in chorus. For last night, that meant his three-song performance would come after the orchestra and band had performed. He had to arrive a school at 7; his group did not take the risers until almost 8:30. As the performances dragged on — let’s be honest, listening to an elementary school orchestra or band when you don’t have a loved one involved is not exactly anyone’s ideal entertainment — Veronica and I struggled with our own patience. We both worried about Ryan. He can lose it over a five- or 10-minute wait. How was he handling this hour-plus? Veronica was confident he’d be OK because he was in school and his behavior is never an issue at school. I wasn’t so sure. I considered checking on him, but I thought that might only agitate him more. I figured if there was really a problem someone would come and get us. Still, as we watched the chorus file into the auditorium, we both half-expected to see a pained expression, or worse, a tear-streaked face. We saw neither. Ryan filed in quietly and with a smile. He sang his parts with proper effort and attention. He seemed to be enjoying himself. As soon as we could, we collected him and headed for home — it was already past the time he chooses to go to bed a lot of nights. He told us that he had played with some of the other boys while he was waiting. He didn’t seem irritated at all, either about the long wait, or the fact that his evening play time had been lost to the concert. Both developments were a pleasant surprise. We know Ryan is capable of overcoming the things he struggles with, and we are always trying to find the proper balance between providing comfort by extricating him from difficult situations and pushing him to figure it out on his own. As we all know, the world will not always bend to suit him. Last night he reordered himself to fit what the world was asking of him. It was a small thing, but one that gives me great hope for the future. These stories bring me hope, too. Glad the concert went well all around! It’s so helpful to remember the little successes when things get trying. Thank you so much! I enjoy your blog as well. 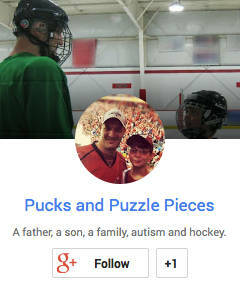 Good to find another autism father out there and I see that sports also plays a big role in your family. I had to let you know that your niece has a friend of hers that is an avid reader of your blog and hockey fan to boot. Apparently your blog is of great assistance to her and the family. So I guess what I am trying to say is that you are “Playing it Forward” and you don’t even know it! She has just had to start Home Schooling her son after the last straw was broken. The teacher left the child in the room while he was in the bathroom, turned out the lights, took the entire class out to recess and locked him in the room. Someone finally found him screaming in the room and let him out. I won’t even go into the other issues that happed in that school. Some schools and educators should be horsewhipped. Feel free to tell the friend to reach out. There are lots of good resources out there.